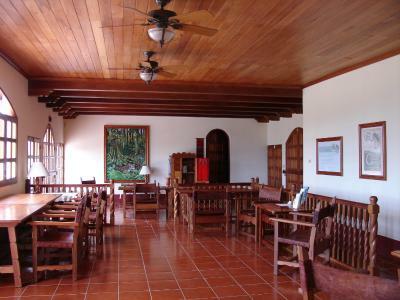 Lock in a great price for Casa del Caballo Blanco – rated 9 by recent guests! The Location was spectacular. The staff was extremely helpful. Ms. Grace, the cook was very lovely. Great authentic local breakfast. Very professional and friendly staff. Great help facilitating tours. Nice room and bed. 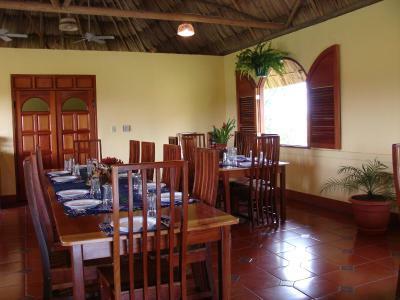 The hotel sits atop a hill with beautiful views, colorful birds and a nice dining room with breakfast. There is internet in a public area. Ricky, the Manager, is really nice and knows birds, so if you are a birder, ask him questions! The room is spacious, with plenty of air flow & mosquito netting over the bed. There is also a refrigerator in the room. The bathroom has nice towels, a big shower with a rain shower head. I would stay here again. The grounds and cabanas were lovely. We had a huge room with a porch which overlooked the hills and palms in the distance. Ricky was a kind and knowledgeable manager and the hot breakfasts prepared by Gloria and Allison were memorably yummy. Ricky was the best host ever. He is so knowledgeable and kind, and definitely made us want to come back. He arranged tours (one with his son Ronnie, who was amazing too), helped us with transportation, told great stories and made sure we got to taste real coconut and limes from the grounds. It's a beautiful place. 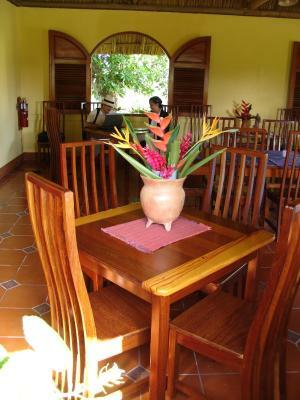 The cook was fantastic- big Belizean breakfasts each morning. The staff were very helpful, knowledgeable and very personable. The view is amazing. Amazing place. Huge grounds but only 6 cabins. All of it looked after by Ricky, the groundsman, caretaker, concierge, driver, guide and just all round lovely, friendly guy. Cabins were large and although they had no AC, they were really cool using just the ceiling fan and with a few windows open. Full fly-nets on the king-size bed and a room fridge with supplied drinking water. Home cooked set breakfast available every morning as long as you let Ricky know the night before (and even then they'll squeeze you in with a little wait). No choice of serving but it changes every day and like the rest of the local food it was fresh and delicious. Dinner was available on request as well but we chose to eat out every day. Ricky provided lots of suggestions and also gave us a lift there. It's not the most facilities heavy place, but it was just an amazing experience. The hospitality of every single staff member and especially Mr Ricky and his son was extraordinary. The place is located short drive from San Ignacio centre (you could probably walk within around 20 min but we never did due to the heat). 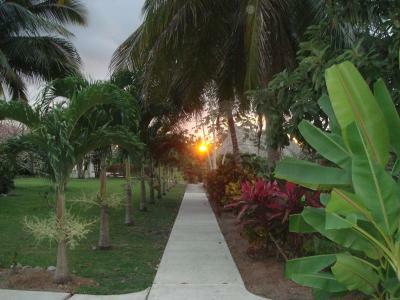 It has extensive beautifully kept garden. 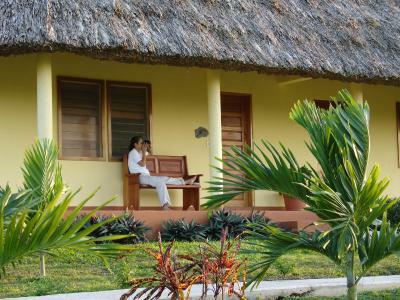 There is only 6 rooms available at the entire property, it makes it very quiet and great to relax after day of sightseeing. Trips Mr Ricky helped us to organise were all great and exceeded our expectations. With beautiful falls, caves, Mayan sites and many more it is definitely worth to visit. We all hope will be back one day. 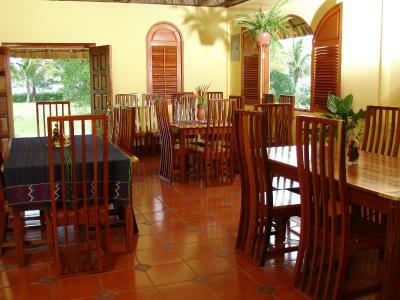 Featuring free WiFi and a restaurant, Casa del Caballo Blanco offers pet-friendly accommodations in San Ignacio. Free private parking is available on site. Certain units feature a seating area for your convenience. Certain rooms include views of the mountain or garden. A Belizean breakfast is served, it changes daily, including fruits, juice, a main course and usually a side dish. When would you like to stay at Casa del Caballo Blanco? 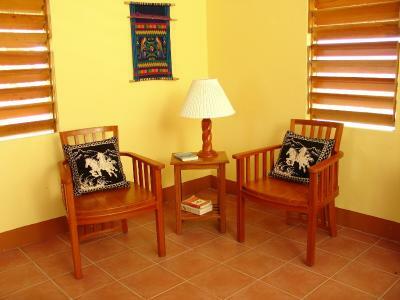 This double room features a private entrance, seating area and tile/marble floor. House Rules Casa del Caballo Blanco takes special requests – add in the next step! Casa del Caballo Blanco accepts these cards and reserves the right to temporarily hold an amount prior to arrival. To confirm a reservation please provide a credit card and authorize a 50% charge; 30 days prior to arrival the remaining 50% will be charged to the card on file. If additional meals or services have been requested the total will be revised and charged at that time. Additional charges incurred while at the site will be charged upon checkout. Hard to find this place. It is just across from local hospital.if you get lost ask for hospital. No sound privacy from the bathroom to bedroom, as the dividing wall doesn’t go to the ceiling. The internet is only in the public building. The water in the shower took awhile to heat up and was only just warm, but comfortable enough to take a shower. The two ladies, Alice and Grace, made breakfast for me in advance of my arrival, so I didn’t have the opportunity to say that I was vegetarian. They are both friendly, but the younger one gave me a hard time about my being vegetarian. I requested something without meat in it and they accomodated it, so it worked out fine. Only the fact that the weather was unusually cool and the cabanas have an open screened area between the walls and the beautiful high thatched roofs, so it was quite chilly at night even with the extra blankets provided. Not a fault of the place, obviously, but something to consider if you are going when it is cool. We did not have our own car. Reaching the hotel was a bit difficult then. We were not really close to San Ignacio. Secondly, we expected more active approach from the staff in the kitchen. It was quite tough to organize breakfast to take away although we announced that one day in advance. Firstly, I have to mention we were very happy to meet Ricky. He was very helpful with planning our trips and offered us help with getting downtown. All the place has its atmosphere and is special. When you go to your room at night, you can see a lot of lightning bugs. And when you get up, you can hear birds singing. 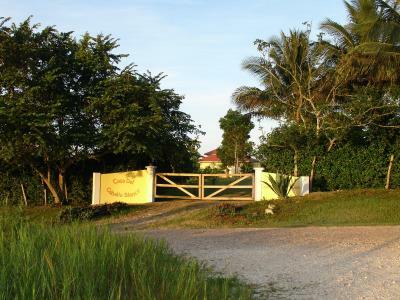 Casa caballo blanco was one of our best accommodations in Belize. 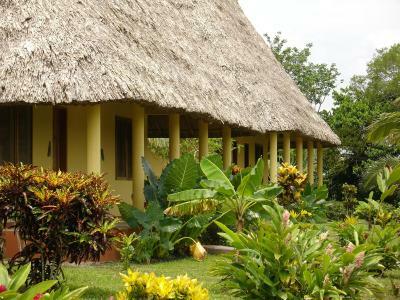 The grounds are incredible- rolling hills, palapa style rooms and varied wildlife. Our gracious host Ricky readily shared his extensive knowledge of the area and directed us towards some amazing little known destinations such as waterfalls and archeological sites. He and all other staff members were attentive to our needs and made us feel at home. 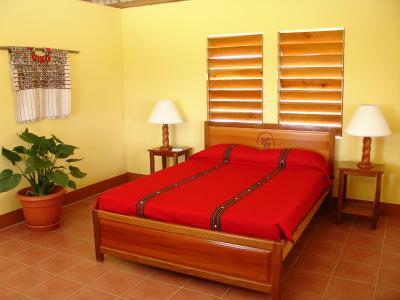 We would recommend this accommodation to anyone seeking a quiet night surrounded by the beauty of the Belizean Forrest. Be advised this is an "eco-lodge", which means there is no air-conditioning and no wifi in the rooms (wifi is available at the custodian's building). The sun sets early in Belize, so all you can do in the room is read, but the lighting is poor, with only one light in the center of the room and no light for the desk. There are no glass windows, just screens with louvers, which means that exterior noise comes directly into the room. In the evening there was a lot of dogs barking, and the morning had birds chirping. The thatched roof is quaint, but it can be an insect habitat, especially for lizards which poop. So be sure to use the screen above the bed when sleeping. It takes a long time to get hot water, several minutes. The custodian was very friendly, perhaps too friendly if you're not the chatty type. The property is very nice. The room was large.